Ever since the rise of Daesh as an internationally destabilizing threat in 2014, documentaries on the so-called Islamic Caliphate have been a constant on the festival circuit. Some like Bernard-Henri Lévy’s dreadful Peshmerga (2016) immerse the audience into the actual fighting, examining on-the-ground battlefield crises and the day-to-day struggles of the freedom fighters. Others like Matthew Heineman’s superb City of Ghosts (2017) examines the plight of the displaced and/or terrorized populations suffering under their rule from the perspective of the scant few who’ve escaped. Alba Sotorra’s Commander Arian: A Story of Women, War, and Freedom is both, mixing unnerving battlefield footage with introspective examinations of the psychological and physical toll suffered by the soldiers. 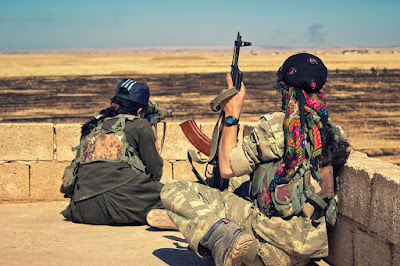 The film centers on the eponymous Arian Afrin, a commander in the Women’s Protection Unit (YPJ), a resistance army of Syrian-Kurdish women that arose in 2013. During an operation, Afrin’s unit was ambushed and she was shot five times by a combatant hiding in a hencoop. The bullets entered her spine, elbow, lung, and sacrum, necessitating a series of gruesome operations leaving her with a ghastly stomach scar not unlike one left by a cesarean. Several feet of intestines needed to be removed, and her bowels never fully healed, leaving her perpetually leaking urine and other fluids. The film opens with Afrin nearing the end of her convalescence as she reintegrates back into her unit as they begin their final push to retake the captured city of Kobane. Though she still hasn’t regained full use of her arms and retains a limp, she still joins her sisters-in-arms in deadly firefights. But the film is mostly interested in the still, quiet moments in between the fighting where Afrin sits, listens, tends her wounds, and eats her meals with her fellow women soldiers. As the title explains, this is a story of women, so even more than the combat footage—which Sotorra clearly risked her life for—the film concerns itself with their fears, memories, and hopes. What is it like to not just be a woman soldier, but a WOMAN in a world gone topsy-turvy from sectarian violence? 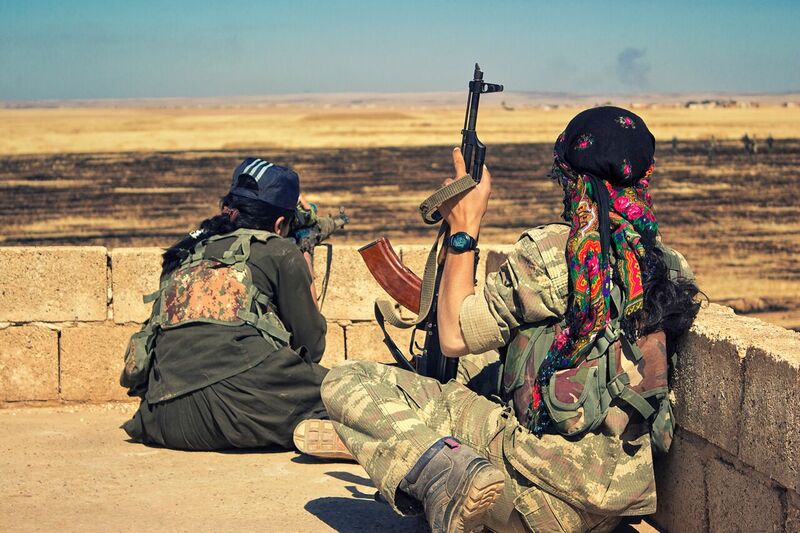 Pointedly, there’s no sense of triumph at the end of the film, even when they retake Kobane. Instead there’s merely a sense of relief that it’s over and a tired determination that there’s still much more to do.